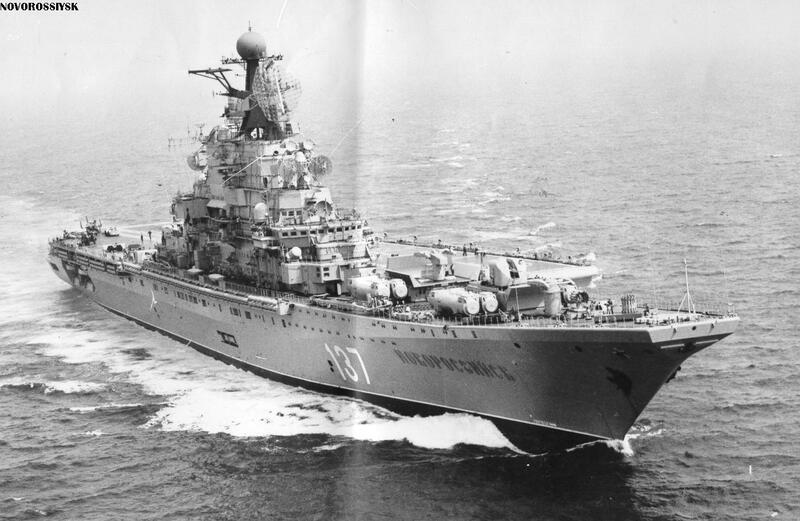 Project 1123 "Kondor" helicopter cruiser Moskva in the Mediterranean during 1968. Moskva and Leningrad were designed as Protivolodochny Kreyser (PKR; Antisubmarine Cruisers) to combat the US Polaris submarines; they spent their entire careers in the Mediterranean. The design was not a success, and they suffered numerous mechanical problems. Moskva had her propulsion plant rebuilt twice and suffered a serious fire in 1975. Another fine view of Moskva. This view demonstrates one of the problems with her design - a tendency to trim down by the bow, resulting in poor seakeeping. 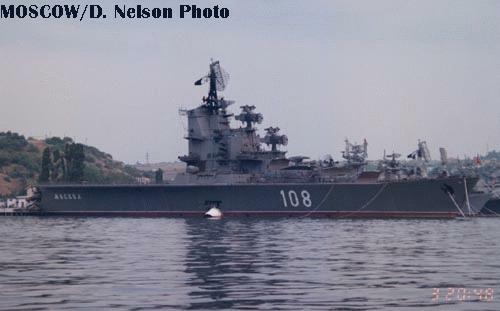 Moskva at Sevatopol, 8/1995. She was stationary and inoperable in this port from 1983 until she was towed away for scrap. Her active service amounted to only 14 years. 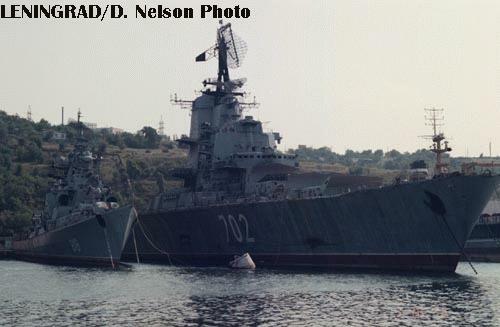 Another view of Moskva at Sevastopol 8/1995. She met her demise on the shipbreaking beaches of Alang, India in 1997. 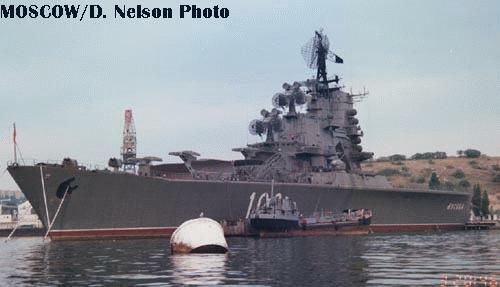 Another third view of Moskva at Sevastopol 8/1995. Note that she is still carrying her radars, unlike the stricken Leningrad (below). She was nominally in service, although inoperable, at the time of this photo. Helicopter cruiser (PKR) Leningrad (Project 1123 "Kondor"), Sevastopol, 1/1995. 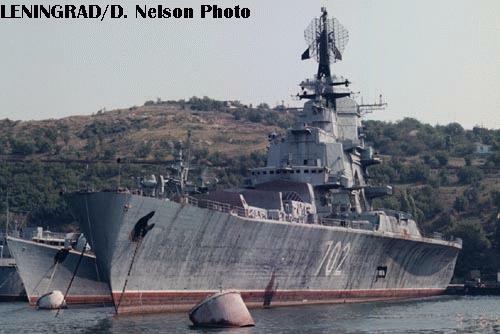 The younger sister of Moskva, she was stricken 24 June 1991 due to her poor condition. She is clearly in disrepair, and many of her radars are gone. 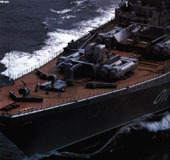 Leningrad was scrapped in Greece in late 1995. Another view of Leningrad. 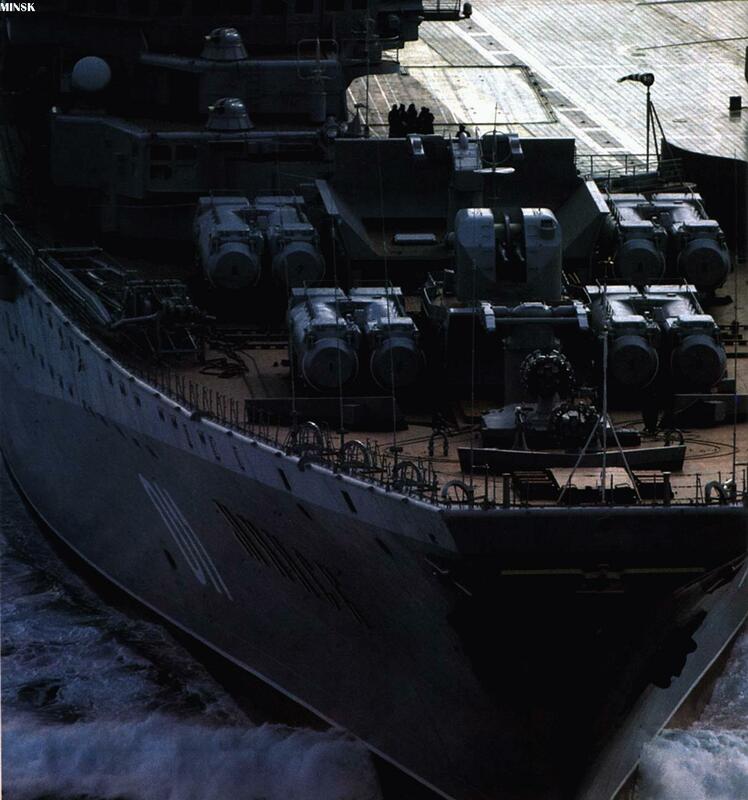 A 'KASHIN MOD' class destroyer is alongside. VTOL cruiser Minsk, Project 1143 "Krechet", underway. Second of the Kiev class Taktycheskiy Avionosnyy Kreyser (TAKR; Tactical Aviation Cruisers), this ship served in the Pacifc. She went to South Korean shipbreakers in 1995 with her sister Novorossiysk; both had suffered major fires. Surpisingly, however, Minsk has been resold to Chinese interests, and is now moored in a Chinese port, reportedly for use as a casino/entertainment complex. An overhead view of Minsk. 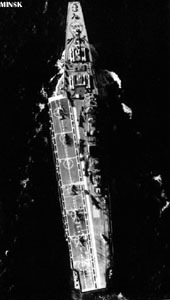 This photo clearly shows her overall layout, flight deck, island and weapons placement. 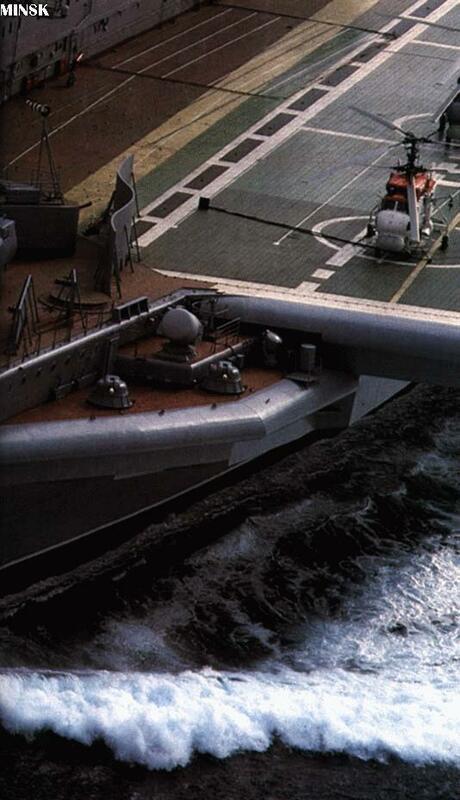 An extreme closeup of Minsk's starboard bow. 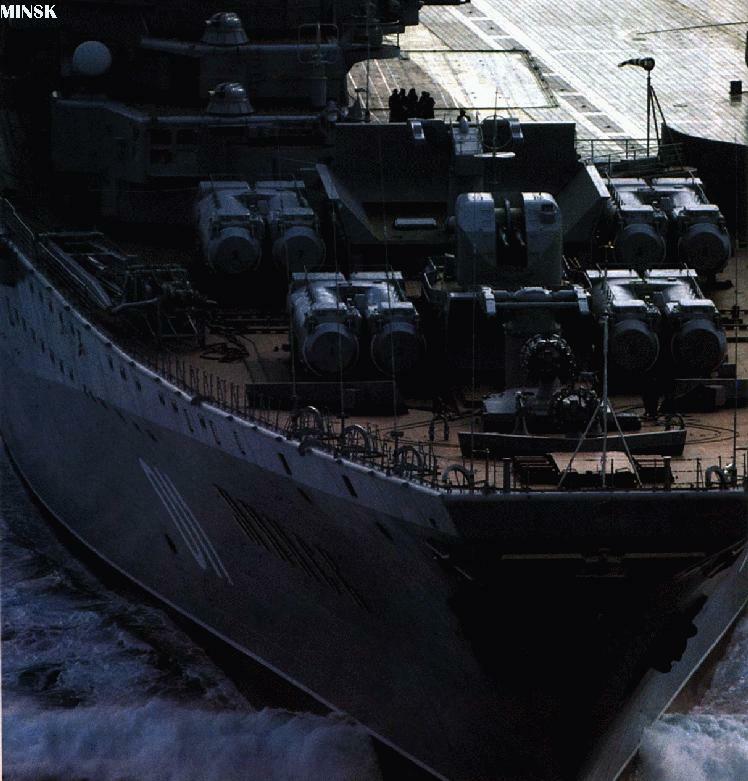 This photo shows (working aft from the bow) the ship's RBU-6000 ASW/anti-torpedo rocket launchers, SUW-N-1 ASW rocket launchers (between two dual tubes for SS-N-12 'Sandbox' SSMs), dual 76.2 mm/3 inch gun (between another set of dual SS-N-12 tubes), SA-N-3 'Goa" SAM launcher, and two AK-630 gatling CIWS on the superstructure with their director radar at extreme left. A reload/replenishment crane is to the left of the SS-N-12 tubes. Another extreme closeup of Minsk's bow. 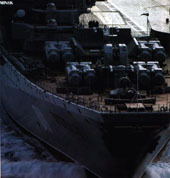 This view shows the same systems as the previous photo, plus a pair of light guns between the RBU-6000 launchers, and replenishment rails on the forecastle. An extreme closeup of Minsk's port side. 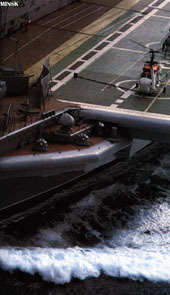 This view shows the forward end of the flight deck, two AK-630 gatling CIWS and their director radar, and an unusual baffle separating the flight deck from the missile launch area. The ship's massive bow wave is also evident. 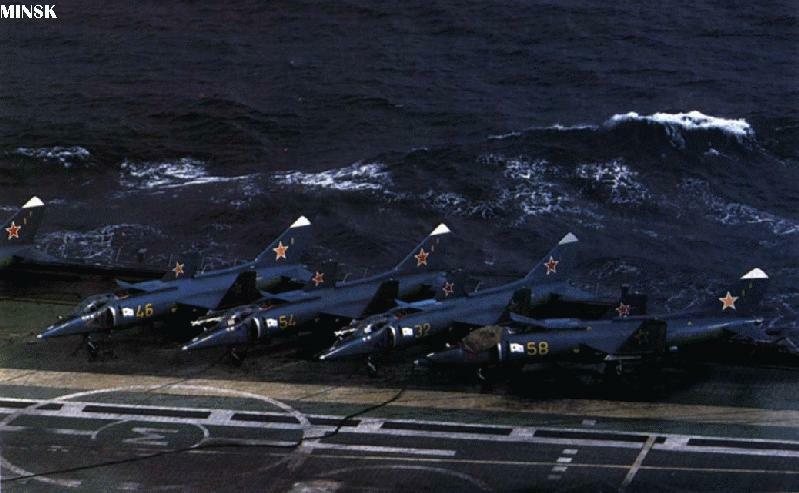 A closeup of Yak-36 Forgers on Minsk's deck. 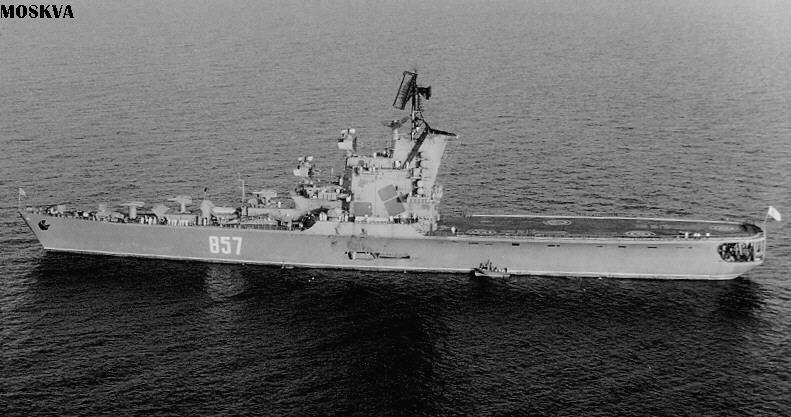 The starboard aft corner of the flight deck was frequently used as a deck park, as seen here. Project 1143.2 VTOL "Krechet" VTOL cruiser Novorossiysk underway. 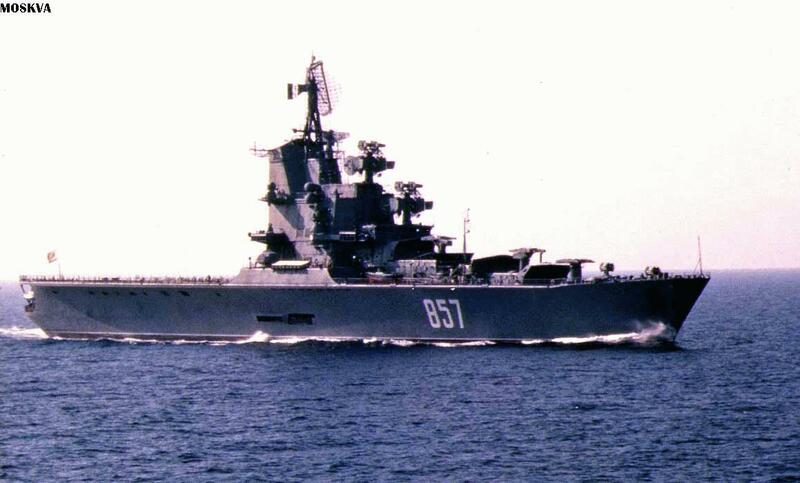 Third of the Kiev class TAKRs, this ship went to the Pacific Fleet upon completion. 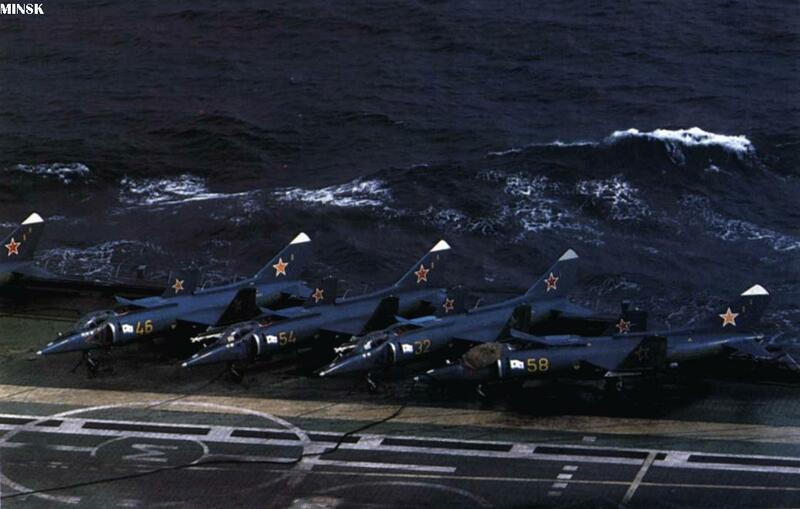 This view clearly shows the flight deck with VTOL spots for Yak-36 Forgers, and the cruiser-style weapons forward. This class was plagued by mechanical problems and a tendency to spontaneously combust, resulting in short careers. Novorossiysk lasted only a decade as an operational vessel, and went to South Korean shipbreakers in 1995, and was finally broken up in 1997. A fine at-sea view of Novorossiysk. Photo by Warren Packer. 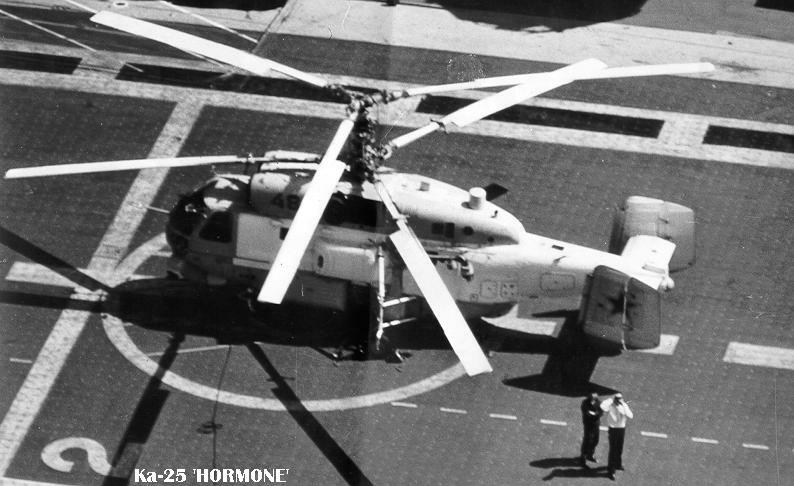 A Ka-25 Hormone ASW helicopter on Novorossiysk's deck. Photo by Warren Packer. Aircraft carrier Admiral Floto Sovyetskogo Soyuza Kuznetsov, Project 1143.5 "Orel", underway from Nikolayev to her Northern Fleet homeport. 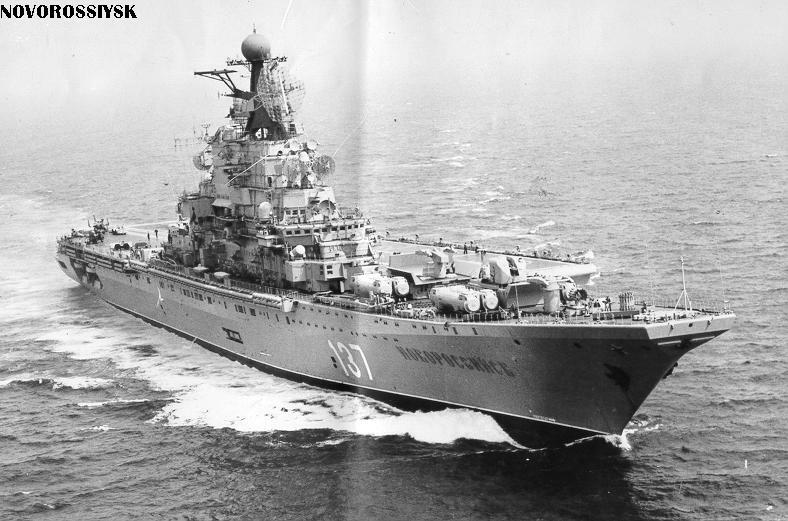 Kuznetsov, although classed as a Taktycheskiy Avionosnyy Kreyser (TAKR; Tactical Aviation Cruiser) for political reasons, is the first and only true carrier commissioned by the Soviet/Russian Navy. Her full name translates as "Admiral of the Fleet of the Soviet Union Kuznetsov". When she left the Black Sea port of Nikolayev in 1991, she sailed from the Soviet Union. When she arrived at her new homeport of Murmansk, the Soviet Union no longer existed, Murmansk was in Russia, and Nikolayev was in the Ukraine, cutting off access to the shipyards there. Although she appears to be complete in this view, it took another four years of work before she was operational. 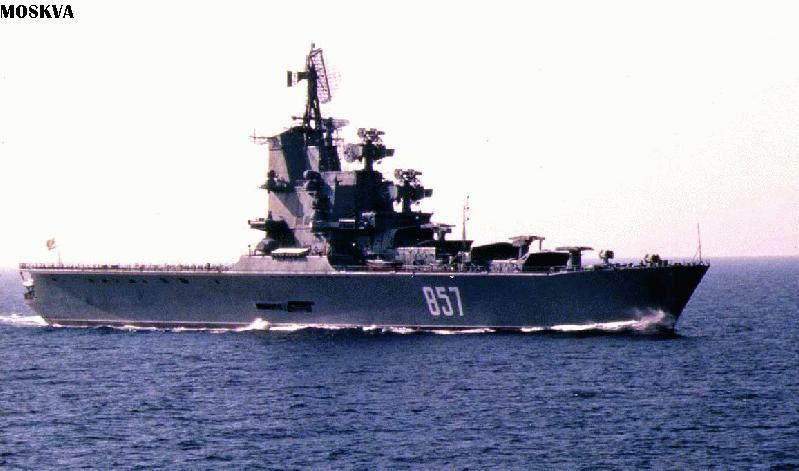 Kuznetsov in the Mediterranean, 1996. 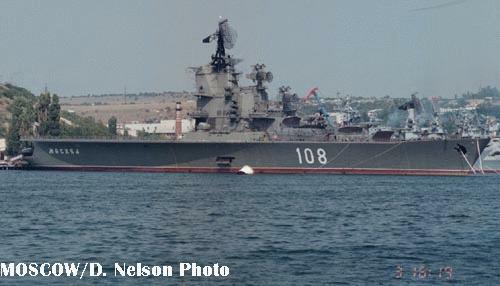 Kuznetsov sailed from Murmansk 23 December 1995 on a three month deployment to the Mediterranean. US sailors from the CVN deployed to the region visited Kuznetsov during the deployment. The ship's angled deck and skijump bow are evident in this view; she does not have catapults. 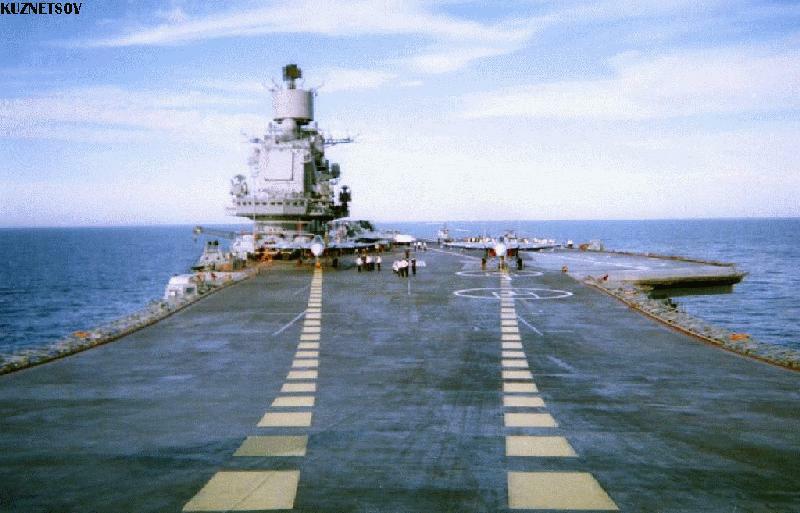 View from Kuznetsov's bow. Hatches covering VLS silos for large antiship missiles are barely visible in the forward deck. The aircraft are Su-27 variants. 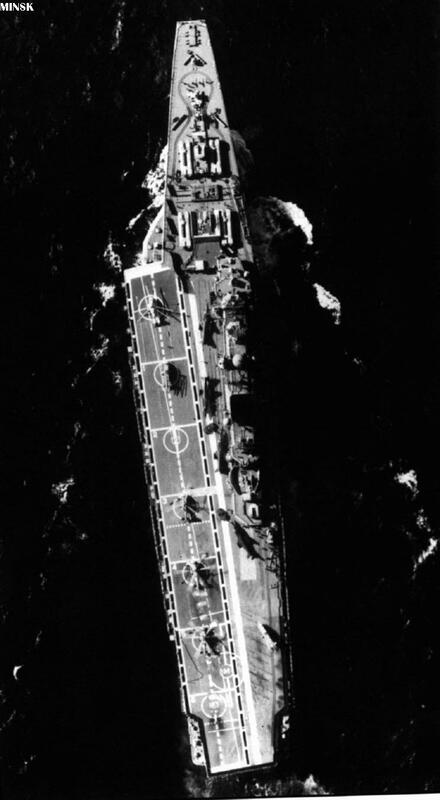 The "Sky Watch" phased array radars visible on her island are reported to be expensive failures. 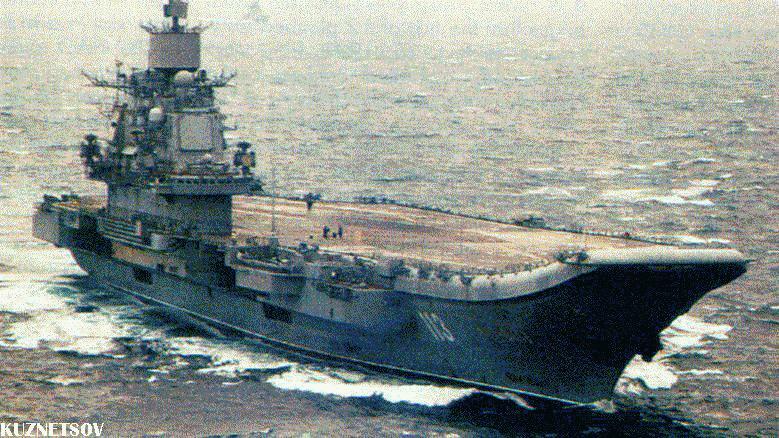 After her return to Murmansk in March 1996, Kuznetsov spent several years dockside awaiting repairs, which could not be afforded.